Qualification - B.D.S and M.D.S. An ambitious qualified Dentist with excellent organizational and interpersonal skills keen to secure a position with a dynamic and progressive dental practice. Dr. Amandeep Dhillon is a practicing Periodontist & Oral Implantologist with over 7 years of experience, he graduated with bachelors degree in dental sciences with distinction/honor in the subject of Periodontology and was awarded certificate of merit in oral surgery, conservative dentistry, oral medicine and also holds a masters degee in Periodontology & Oral Implantology. His zeal for constant learning lead him to pursue a certified course in smile designing from the Prestigious New York university college of dentistry (USA) and a certification program in Oral Implantology from University OF Murcia, SPAIN. Dr. Amandeep has numerous national and international research publications to his credit and has also won awards at national conferences. He specializes in treating Gum related problems including but not limited to cosmetic surgeries, bone grafting, smile designing and oral implants. Master of Dental Surgery (M.D.S), Periodontology And Oral Implantology, I.T.S CDSR Dental College, Muradnagar, Chaudhary Charan Singh University,U.P. JUNE 2013 - JUNE 2016. The Metro Dentist , Dental Health And Implant centre Rajouri Garden , New Delhi , while independently managing the dental clinic, from February 16th 2012 till May 30th 2013. Headed the dental wing of Santan Dharam Charitable Hospital, Kirti Nagar, New dehi from February 16th 2012 till May 30th 2013. Independently handled a private clinic ( Popli dental clinic , Tilak nagar, New Delhi ) , since 1st January 2011 till 1st February 2012. 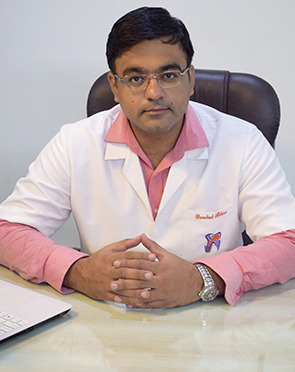 Associate Dentist at Smiling Pearls Multispecialty Dental Clinic , LGF -25 ,Suncity Arcade, Gurgaon India: since 5th February 2010 till December 15th 2010. Observer under Dr. Joseph F. Viana, ( D.D.S) , at 970 North Broadway , suite 211 Yonkers, NEW YORK 2013 10701, 20th august 2010 - 13th September 2010. Dr. Dhillon performs 8 different procedures. Click on a procedure name to see more details and to view doctors for that specialty.